Good things come to those who wait. Patience is a virtue. Those aphorisms were more than just empty clichés to right-hander Orie Arntzen, who debuted as a 33-year-old for the Philadelphia Athletics in 1943. Nicknamed “Old Folks” for obvious reasons, Arntzen won only four of 17 decisions for one of the worst teams of the decade. But six years after his lone season in the big leagues, Arntzen gained national attention by going 25-2 for the Albany Senators in the Class A Eastern League to earn the Minor League Player of the Year award from The Sporting News. Orie Edgar Arntzen was born on October 18, 1909, in Beverly, Illinois. His parents, Leopold and Kathryn Marie Arntzen, were children of German immigrants and raised five children (two others did not survive infancy). The youngest member of the family, Orie grew up on family farms in the Mississippi River basin in small rural communities in western Illinois and northeastern Missouri. Orie listed his occupation as a plumber on the 1930 census, and that year he resided with his folks in Good Hope, Walnut Grove Township, Illinois. Arntzen was a big, 6-foot-1, 200-pound right-handed pitcher, but little is known about how he began his professional baseball career during the height of the Great Depression. Minor-league baseball offered young men a chance to travel and forget the harsh economic realities of the time; however, the low salaries often forced players to choose between a career on the diamond and more steady income. And so it was with Arntzen. In 1931 he signed with Bees of the Class D Mississippi Valley League who played their home games in Burlington, Iowa, about 40 miles from his home. However, it is not certain if he ever played a game for them. Contemporary newspapers typically reported that Arntzen’s foray into pro baseball began two years later, in 1933, with the Davenport (Iowa) Blue Sox and Peoria (Illinois) Tractors of the same league. When the league disbanded at the end of the season, Arntzen (with a combined 2-6 record and an ERA north of 6.00) returned to Good Hope, where he worked at a hardware store. In 1936 and 1937 Arntzen posted records of 14-11 and 19-9 respectively and logged in excess of 200 innings each season for the Martinsville (Virginia) Manufacturers of the Class D Bi-State League and was named to the all-star team both years.3 More importantly, he caught the attention of the St. Louis Cardinals, whose legion of scouts left few prospects uncovered. The club took a chance on the 27-year-old recruit, whom they signed and placed with the Asheville (North Carolina) Tourists, one of five Class B clubs among the organization’s 27 minor-league affiliates. It was a short-lived relationship. A 3-3 record and team-high 5.40 ERA in 50 innings earned Arntzen his release in the offseason. Arntzen helped guide the Cedar Rapids Raiders to two consecutive first-place finishes in the Class B IllinoisIndiana-Iowa (Three-I) League in 1939 and 1940. With a staff-best 16 wins for the league champions in 1940, the 30-year-old Arntzen was purchased by the Toronto Maple Leafs, an affiliate of the Philadelphia Athletics in the International League. Arntzen established permanent residence in Cedar Rapids, where in the offseason he worked for the Iowa Manufacturing Company, a maker of roadbuilding equipment. In October 1936 he had married Mary Murray, and together they raised three boys, Hal, Darrell, and Gary. Assigned to the Williamsport (Pennsylvania) Grays of the Class A Eastern League in 1941, Arntzen fit in on a pitching staff which boasted five hurlers 30 or older. The mild-mannered Midwesterner was second on the club in wins (15) and innings (207) as the Grays finished second in the league. The Sporting News reported that Arntzen “spent most of the 1942 season visiting doctors” because of his bad back.4 He remained in Cedar Rapids and worked full-time throughout most of the summer. In August he finally returned to Williamsport to enjoy the best stretch of pitching in his career, winning seven of eight decisions and posting a 1.71 ERA in 63 innings. The A’s were arguably the worst team in the American League in this era. They had finished in last place every year since 1935 (except for seventh-place finishes in 1937 and 1939). The team’s pitching staff was especially atrocious, made even worse by the loss of staff ace Phil Marchildon (whose 17 wins the previous season were the most for an A’s pitcher since Johnny Marcum won the same number in 1935) to the military. Owner-manager Connie Mack groomed a trio of rookies, Arntzen, 26-yearold Don Black, and 28-year-old Jesse Flores (acquired in the offseason from the Chicago Cubs), as starters. Teammates affectionately called Arntzen “Old Folks,” a not-so-subtle reminder that he was the oldest pitcher of the staff. 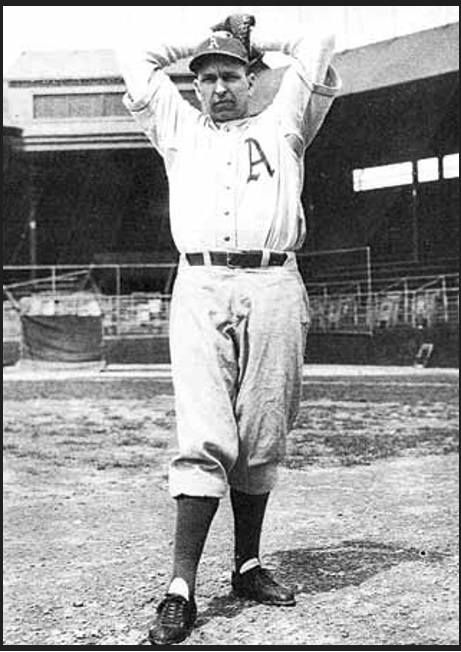 Debuting in the A’s first game of the season, Arntzen hurled the final inning of relief in a loss to the Washington Senators in Griffith Stadium, surrendering two hits and a run. After pummelings in his first two starts, Arntzen tossed a complete-game five-hitter against the Cleveland Indians on May 15, but lost as the A’s (the AL’s lowest-scoring team in 1943) were shut out. Old Folks picked up his first big-league win his next time out by holding the St. Louis Browns to six hits and overcoming eight walks in a 2-1 victory at Sportsman’s Park. He pitched consistently throughout June, July, and August, carving out a respectable 3.36 ERA in 107 innings, yet won just two of 12 decisions as the A’s went 2-15 in the games he pitched (12 starts and five relief appearances). Both wins were complete games, the latter a six-hitter with nine strikeouts against Washington. After an unexpectedly promising start (26-24), the A’s went 23-81 after June 15. Arntzen scattered eight hits over 6⅓ innings at Fenway Park on September 3 to give the A’s just their second victory in their last 26 games. The triumph proved to be his fourth and the last one in his big-league career. Arntzen struggled in his final six appearances of season (15 earned runs in 9⅔ innings). After the A’s 100th loss, on September 27, Arntzen was sent to the Toronto Maple Leafs in exchange for pitcher Luke Hamlin, during a frenzied period at the conclusion of the season when Mack made wholesale changes to his roster.8 For the season, Arntzen went 4-13, completed nine of 20 starts among his 32 appearances, logged 164⅓ innings, and posted a 4.22 ERA, the second-worst in the AL among qualifiers. In 1946 Arntzen returned to Albany, where he became somewhat of a minor-league sensation and feel-good story over the next five years during a golden age of professional ball. Organized Baseball gradually emerged from the doldrums caused by three years of war when hundreds of players hung up their spikes to serve the country. The number of minor leagues expanded from 12 in 1945 to 59 in 1949 with teams in 438 cities. The minor leagues also underwent a reclassification, as the Triple-A level was established. After a rough start in 1947, the 37-year-old Arntzen offered to quit. “I haven’t been any help to the club and I don’t like to take money under false pretenses. And that’s what I am doing now,” he explained.11 Encouraged by player-manager Pinky May to stay, the aged right-hander won nine straight decisions to finish with an 11-7 record. While most hurlers Arntzen’s age transitioned into a post-baseball career, the Cedar Rapids resident spent the spring of 1948 wrangling with his employer over a leave of absence in order to pursue a pastime played by men young enough to be his son.12 After finally reporting in May, the Eastern League’s oldest hurler added a new pitch to his arsenal, a screwball that he learned from a teammate, grizzled 37-year-old veteran Johnny Lanning, on his way down through the minors after spending parts of 11 seasons in the big leagues. At one point Arntzen tossed 31 consecutive scoreless innings, won eight straight decisions, and finished with a 15-4 record, good for the league’s best winning percentage (.789). When asked about his fastball, Arntzen once replied incredulously, “Speed? I haven’t anything left anymore. But my control is good and I can throw the ball just about where I want it.”13 Among pitchers with 100 innings, he ranked second in ERA (2.13) and third lowest in walks per nine innings (2.0). For the second consecutive season, the Senators finished in second place but lost the league championship series. Arntzen’s victory over the Hartford Chiefs in the 1949 season opener in Albany’s Hawkins Stadium inaugurated a fairy-tale season for the 39-year-old hurler. Described as “ancient,” “aged,” “venerable,” and “elderly,” Arntzen garnered national headlines by winning 15 consecutive decisions (two off the league record set by Tommy Fine in 1946) and established a league record with 25 wins for the first-place Senators.14 “Against right-handed batters Arntzen aimed his big screwball at the catcher’s right knee,” wrote Pat Barnes. “The ball started wide of the plate but broke into the corner for a called strike. Against left-handed hitters he aimed at the catcher’s left knee. The phenomenon headed straight for the plate then broke wide.”15 Five days after being feted on “Orie Arntzen Night” at Hawkins Stadium (and winning the game), Arntzen won the pennant-clinching game on August 28.16 Twelve years older than the second-oldest pitcher on the team, “Old Folks” completed 21 of 25 starts, relieved eight times, and posted a 2.79 ERA in 216 innings. His 1.7 walks per nine innings and .926 winning percentage (25-2) easily topped the circuit. The Associated Press reported, “The screwball has helped make old Orie a minor league mound marvel.”17 Only Albany’s upset loss to Wilkes-Barre in the Eastern League’s playoffs tempered Arntzen’s most valuable player and pitcher of the year awards. After the 1949 season, Arntzen won the 13th annual Minor League Player of the Year given annually by The Sporting News from 1936 to 2005. He joined the likes of Johnny Vander Meer (1936), Phil Rizzuto (1940), Frank Howard (1959), Johnny Bench (1967), and Pedro Martinez (1991); only Ripper Collins (who won the award in 1944 after a productive albeit relatively brief big-league career) was older. In the offseason, Arntzen capitalized on his notoriety by participating on several barnstorming tours, most notably to Huron, South Dakota, for the “Baseball Pheastival,” which entailed playing ball and hunting pheasants, though not at the same time. Arntzen’s final season with Albany, in 1950, was as disappointing as his previous one was exhilarating. Suffering from arm pain most of the season, he limped to an 8-5 record, but posted a career-worst 6.28 ERA in 106 innings, and drew his release in the offseason. Arntzen was not out of baseball long. Adam Pratt, former owner of the Cedar Rapids Rockets of the Class C Central Association, had purchased the Duluth (Minnesota) Dukes of the Class C Northern League and offered Arntzen a position as player-manager. The Sporting News reported that the 41-year-old hurler was hospitalized with coronary problems in early May 1951, casting doubts on his season.18 But Arntzen returned, and won 12 of 15 decisions to lead the league in winning percentage (.800) for a seventh-place team in an eight-team league. Replaced as manager in midseason, Arntzen was given his outright release at the end of the season. The rubber-armed Arntzen pitched for and managed Iowa Manufacturing in the M&J League in Cedar Rapids the next few seasons. After leading the team to the league title in 1952, Arntzen was given one last hurrah in Organized Baseball. He made two ineffective late-season appearances for the Cedar Rapids Indians in 1952. In his 17-year minor-league career, Arntzen compiled an impressive 194-99 record and logged 2,385 innings. Arntzen continued to work for Iowa Manufacturing after his career in Organized Baseball. On January 28, 1970, he died at the age of 60 in Cedar Rapids following a short illness.19 A memorial service was held at the Trinity Lutheran Church and he was buried at the Cedar Memorial Cemetery. 1. The Sporting News, June 29, 1949, 15. 3. “Prepare for Record Crowds for Bi-State All-Star Game,” The Bee (Danville, Virginia), June 16, 1937, 8. 4. The Sporting News, March 18, 1943, 6. 5. Sid Feder, “Mack Doesn’t Expect His Athletics to Go Anywhere in Particular,” Muscatine (Iowa) Journal and News, April 6, 1943, 5. 7. Associated Press, “Arntzen Joins A’s,” The Express (Lock Haven, Pennsylvania), March 30, 1943, 4. 8. Associated Press, “Mack Busy With New Player Deals,” Alton (Illinois) Evening Telegraph, September 28, 1943, 11. 9. Associated Press, “Davenport Entry Winner of Semi-Pro Baseball Tourney,” Mason City (Iowa) Globe-Gazette, August 6, 1945, 14. 10. The Sporting News, June 29, 1945, 15. 12. The Sporting News, March 24, 1948, 26. 13. Associated Press, “Wished He Would Have Met Up With the Screwball Earlier,” Beatrice (Nebraska) Daily Sun, August 12, 1949, 6. 14. Evening Tribune (Hornell, New York), May 24, 1949, 8; Troy (New York) Record, May 30, 1949, 10; Times Record (Troy, New York), June 9, 1949, 47; Gettysburg (Pennsylvania) Times, June 22, 1949, 3. 15. Pat Barnes, “Red Peppers,” Cedar Rapids (Iowa) Gazette, September 22, 1949, 19. 16. The Sporting News, August 31, 1949, 39. 17. Associated Press, “Wishes He Would Have Met Up With Screwball Earlier,” Beatrice (Nebraska) Daily Sun, August 12, 1949, 6. 18. The Sporting News, May 23, 1951, 36. 19. “Orie E. Arntzen, Former Baseball Player Dies at 60,” Cedar Rapids (Iowa) Gazette, January 29, 1970, 3.